I am bringing you an Enchilada Frittata today. I got the inspiration from Eggs.ca. 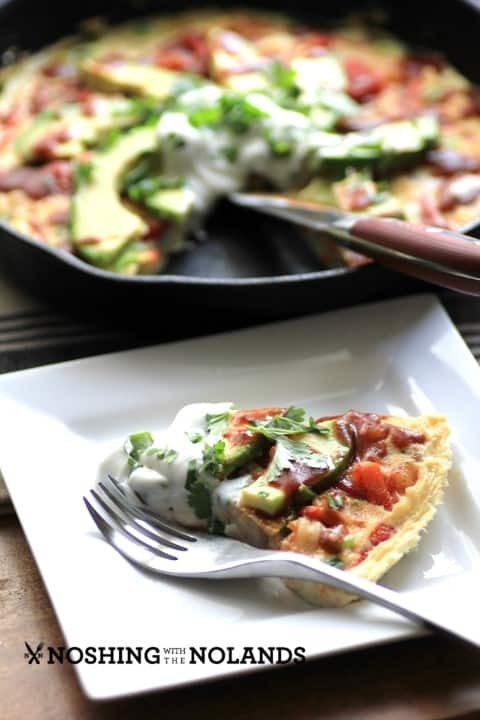 They have 30 gorgeous looking frittatas on their site. In particular this pretty Frittata San Remo caught my eye. Then I went even further and started thinking of an enchilada, a seafood enchilada. I wanted some of the ingredients of an enchilada with lots of wonderful eggs. Eggs are part of a well-balanced diet. They provide 6 grams of high-quality protein and 14 important nutrients like Vitamin A, D and E, iron, zinc and choline. This Enchilada Frittata packs a punch of flavor but I didn’t want this to be spicy so that it would over power the eggs and shrimp. Only a light dusting of ancho chili pepper was needed on the shrimp to add loads of taste. My family raved about this frittata and it was devoured in very little time. Using fresh eggs and fresh quality ingredients will always give you a superior meal. 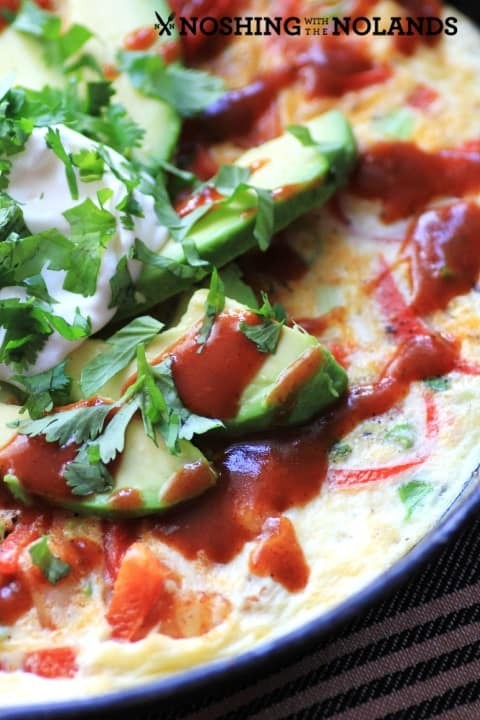 There are lots of healthy delicious ingredients in this frittata, the light fluffy eggs, the roasted red peppers, creamy avocado, flavorful shrimp and delicious light sour cream and enchilada sauce. A delicious Frittata inspired by the ingredients in an enchilada. Dust the shrimp with the ancho chili powder, paprika and garlic salt. Cook quickly in 1 Tbsp. butter in a hot pan for 2-3 min. Set aside, refrigerate if made ahead of time. Heat a large cast iron pan and add the remaining Tbsp. of butter. Whisk the eggs with the 1 Tbsp. of water. Add the eggs to the pan and sprinkle the shrimp, red peppers and green onions on top. Cook on medium to medium low for 5 min. until the bottom is set. Broil to set the top for 1-2 min. Top with the sliced avocado. Add a dollop of sour cream in the middle. Sprinkle with the cilantro and drizzle with enchilada sauce. Add some hot whole wheat tortillas on the side to finish off the enchilada experience. Serve with a big salad and you have a fantastic and quick meal that everyone will love. Come follow along with Egg Farmers of Canada on Facebook, Twitter and Pinterest for the latest tips and fantastic recipes!! We are fortunate in Canada to have year round high-quality protein available to us. Egg Farmer’s of Canada are partnering with Heart for Africa, where they are building a sustainable egg farm in Swaziland. This is a very important project for Egg Farmer’s of Canada because they recognize the global fight against food insecurity and malnutrition. The sustainable farming initiative is called Project Canaan and will impact thousands of people living in the region supplying them with high quality protein. This is essential for human growth and development. The project will help feed orphaned children and teach Swazi locals world-class farming practices commonly used throughout Canada. By working together under the system of supply management, the more than 1,000 family egg farms in Canada can support causes like this that help communities at home and abroad. Disclosure: I am participating in the Egg Farmers of Canada managed by SJ Consulting. I received compensation in exchange for my participation in this campaign. The opinions on this Blog are my own. Just beautiful! I love the addition of shrimp! This looks so delicious! I’ll have to make this for my husband sometime soon. I’m trying to cook more with avocado, just bought some for the first time last week! So, I need to try this one. Looks amazing! 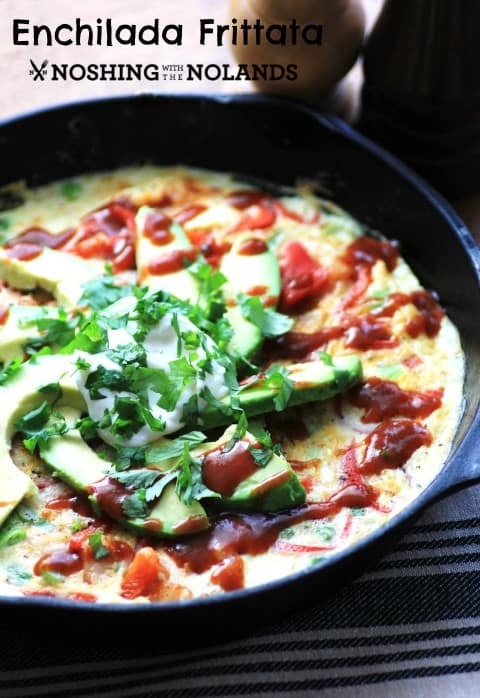 Love this Tex-mex style frittata; destined to become a classic! Tara, I just love the flavors in this dish. It is so up my alley. Tara, your frittata looks scrumptious! I applaud the restraint with the ancho chile as to not overpower the eggs and shrimp. Lovely, lovely work. Wow Brooks, thank you so very much!! What a great idea for a frittata. I need a new breakfast item, can’t wait to try this recipe this weekend. We’ve been doing breakfast sandwiches every Saturday for a while. Last weekend Dan said he was starting to get tired of them. I think this will go on the weekend menu really soon so that we have something new to try. It looks simply delicious! Thanks so much Debi, I hope you enjoy it!! G’day This looks So delish Tara! Wish I could try some now! I always do a thanksgiving “friends” brunch on the Sunday after Thanksgiving. I will now be adding your frittata to my menu! Thanks. You always take the best pics and your recipes are so creative. This one just boggles my mind in a good way. Mexican is probably my favorite food!! Love the shrimp addition…now I am hungry! What a gorgeous Frittata! You can never go wrong with Enchilada flavors! 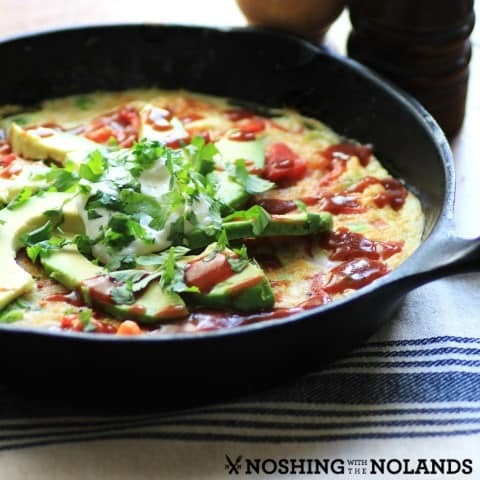 Frittatas are a staple in our home, but we’ve never attempted an ENCHILADA Frittata! Genius! I love the avocado on this! Looks so pretty! I adore avos, thanks Kristen! Oh wow… I love breakfast and this looks like it would be perfect this weekend! Love Egg Farmer’s of Canada. You just have to love a company that cares that much. Thanks so much Kim, ya we love eggs here and Egg Farmer’s of Canada!